Today, experts in the IT related fields of specialty are needed more than ever before. The job market is constantly full of employers looking for people who would be proficient in one or another profession that revolves around software or web development. That being said, these skills have seen a surge in popularity from the employee’s side, too. 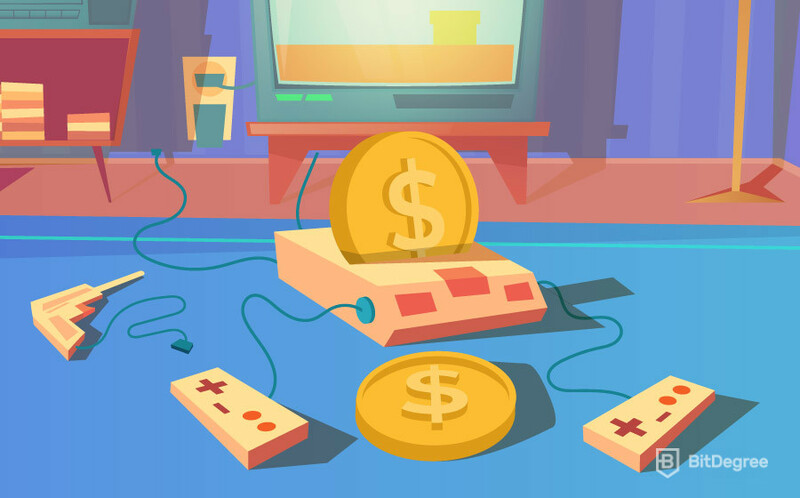 With such an increase in popularity, more and more people are starting to wonder how much do different individuals in the tech industry make. And today, I would like to tell you about the software developer salary. We’ll start off by talking about the profession itself. I’ll give you a very brief job description of what a software developer does and what such a line of work entitles. I’ll also explain the difference between a software developer and a software engineer – you may not believe it, but many people to this day confuse the two. Afterwards, I’ll tell you about the main types of software developers that you might encounter. Once that is done, we’ll be able to finally move on to talking about how much do software developers make. Before we get going with the actual numbers of the average software developer salary, we should talk about what a software developer actually is. Honestly, it’s a job title that has almost become a buzz-phrase – people throw it around in almost every conversation that somehow involves tech or IT, in general. With this in mind, it’s probably worth knowing the facts about the specialty, before moving on any further. As the name implies, software developers are people that, well… Develop software. That’s easy, right? Well, this isn’t the only thing that they do, however. Software developers have a whole lot of different responsibilities that range according to their job experience and personal skill. On top of developing new programs and systems, software developers also have to manage the already-existing ones, work with the rest of the team to ensure that everything works fine and that the development process is smooth and streamlined, and perform many more different tasks. Now, to this very day, many people still confuse software developers with software engineers. Just to avoid scenarios where you’d find yourself looking for the average software developer salary and would instead find a software engineer’s one, let’s clear the confusion up. There’s a really good way of looking at these two professions. Remember this one golden rule – a software developer usually cannot get involved with software engineering, while a software engineer can easily get involved with software development. To put it very simply, software engineering is when you create the actual platform for the software, and software development is when you work with the software itself. This is an extremely TL;DR version of the matter, but you should get the idea. As you probably know, every job in the world has different tags attached to it. Whether you choose to work as a plumber or a maid (or a software developer, for that matter), you will find that each of these jobs has different sub-titles. I’ll give you an example so that you could better understand what I’m talking about. Let’s say that you’ve decided to go and work as a mechanic. If you’ve only watched a few YouTube videos and read a couple of pamphlets about “how to be a mechanic”, you would get an “entry-level” or “beginner” mechanic job title. Your coworkers and managers would be keeping a close eye on you, and you probably wouldn’t get many difficult tasks in the very beginning. As opposed to that, if you were to have, let’s say, ten years of experience in the field of automobile repairs, you might receive the title of a “junior” or “senior” mechanic. Given your experience, you would probably deserve a “senior” title, but a lot of workplaces grant these titles only to the people who have worked for the company for a long period of time, not taking into account their overall experience in the field. As a senior mehanic, you would get some of the most difficult tasks, supervise your less-experienced colleagues and perhaps work on some separate projects. Naturally, your salary would be a reflection of that. The same thing applies to the software developer salary, and not only the salary itself. Software developers have different sub-titles that help to identify their workload, experience and, ultimately, their average software developer salary. With all of that said, let’s check out what different types of software developers are there. An entry-level (beginner) software developer is a person who has just recently come into the industry. Whether they have learned software development on their own (with the help of the above-mentioned YouTube), took online courses or have finished (or are still learning at) university, these people usually have no prior experience in the field. Entry-level software developers are usually searching for one thing, and one thing alone – experience. They are yet to even begin making a name for themselves in their respective communities, so this should be the number one priority on the top of their list. Also, if it isn’t experience, then these people are usually “in it” for college credit – let’s say, if they want to pass a specific subject, they need to practice in a real company. Employers know this, and so they pick and give these people tasks that are appropriate for both their skill level and their workload. These tasks commonly consist of some type of content management, error checks, teambuilding activities and so on. When it comes to the entry-level software developer salary, it would be logical to think that it’s not going to be much, especially when you keep all of the variables in mind. However, people still say that the salary is still quite above the average (the average yearly salary in the US is around $3700 USD)! Whether that’s true or not, you’ll just have to wait and see. Until then, we still need to cover two groups of software developers. So, without further ado, let’s continue on to the next group. Junior software developers are both the most interesting and the most difficult group of the three. 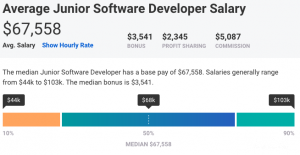 Many people reference the junior software developer salary when they want to talk about the average software developer salary, in general. However, as you will soon find out, that is not the case – not even by a longshot. Why is that? I’ll talk about it more when we reach the junior salary part of this article. Until then, however, I can say that the reason is both pretty simple and really difficult – depends on the way you look at it. With that said, junior software developers are considered to be people who have already got some sort of experience in the field of software development, but are still far off from being able to call themselves true masters of the craft. These people are usually recent graduates that might have worked some odd development jobs here and there, but are now at that point in life where they want to find a stable, long-term job and start to REALLY grind the field of development, both from the theoretical and the practical sides of things. When it comes to the junior software developer salary, I’ve already mentioned that it’s a difficult topic. However, if we were to talk about it as a standalone thing (instead of comparing it to the other group salaries), then it’s quite self-explanatory – the more a junior developer works, the better they produce the results and the more he or she chooses to learn – the higher will be their salary! The final group – senior software developers – are the top that this profession has to offer. These are the people who have been in the game for the longest time. Some of them have spent their whole lives in this industry, and now know it like the back of their hand. Same as the mechanics that I’ve mentioned earlier, senior software developers are bound to receive the most difficult tasks in the company. It makes sense, though, right? The more that you know about the subject (and the bigger of an expert you are in the field), the more difficult the task you will be trusted with is. A software developer of this stature might get a few tasks like this, on top of other responsibilities. One of the more common responsibilities (again – this is true with most jobs out there) are to manage newcomers to the company and to the industry, as a whole. It is the responsibility of a senior developer to make sure that these newbies learn everything that they might require in the job, and that they develop a thorough understanding of the profession in general. With them being as occupied and as experienced as they are, it’s only natural that the senior software developer salary is going to be the highest of the three groups. There are many people that take this number and use it as a point of reference in a discussion about how great of a career path software development is. 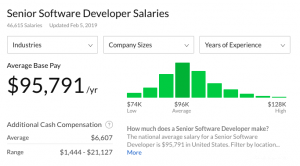 Now that you have all of the information about the three big groups of software developers, we can finally transition and start talking about the average software developer salary. That is the main question that you came to this article to get answered. Now, finally, it’s time to address it. One last thing, though – do keep in mind that all of the numbers provided below are just estimations. Since salaries are such volatile objects, it’s impossible to give a specific number at any given time. Furthermore, your software developer salary can depend on many different things – location, skill level, workload, etc. Let’s begin by talking about the entry-level software developer salary. I’ve mentioned earlier that many people think that, because it’s a beginner position, the pay is really low. Well, let’s see if that’s really the case. According to Payscale.com, the entry-level software developer salary should be about $65,000 USD per year, or almost $5460 USD per month. As you can probably see for yourself, this is far from being a bad salary! It’s almost 1,5 times larger than the average salary in the US! Seeing this, it is probably one of the best examples of just how much good software developers are needed in the current job market. As I’ve mentioned earlier in the article, the junior software developer salary is… tricky. Now, why is that, you might ask? Simple – it overlaps a lot with the other two groups. But what does this mean, exactly? So as to not go too in-depth and further away from the topic at hand, let me just put it this way: the junior software developer salary is the most fluctuating out of all of them. At any given point in time, the majority of the junior group could swing from those who have just become “junior developers” to those who are soon to become “senior developers”. All things considered, PayScale still provides a pretty accurate representation of what a junior software developer salary looks like, at this point in time. According to the site, a junior software developer should make around $67,500 USD annually, or $5625 USD per month. As you can see, it is estimated that junior software developers currently make around two hundred bucks per month more than their beginner colleagues. Given this fact, it’s probably safe to say that there are a lot more less-experienced junior software developers in the market than those who would already have many years of experience under their belts. Finally, we have the senior software developer salary. Let’s see if the rumors about it being an amazing salary have any merit to them. According to Glassdoor.com, a senior software developer salary should fluctuate at around $95,800 USD annually, or almost $8000 USD per month! I think it’s safe to say that it definitely is an amazing salary. It’s more than double the average salary in the US! 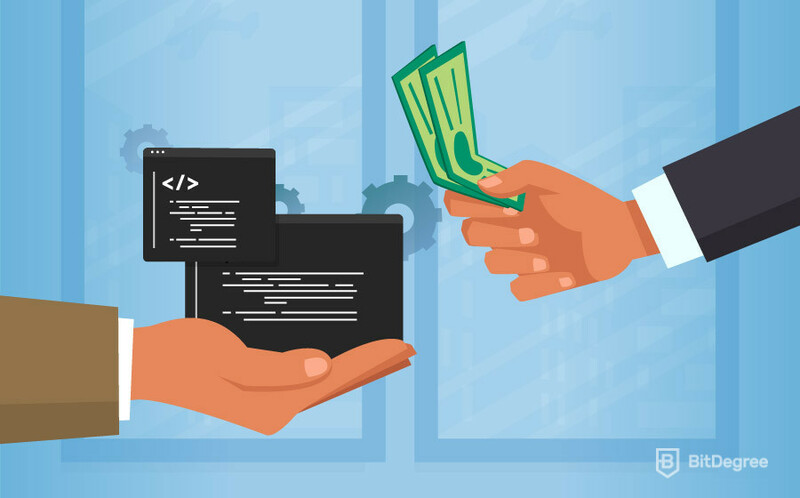 Now that you know the approximate numbers that define the average software developer salary, you can better understand why this line of work is so sought-after. I hope that this article answered the question “how much do software developers make?”. If you plan to study and work as a software developer, I wish you the best of luck!